Mark found a way to stop time. This 53-year old looks younger and healthier with age. He's the George Clooney of fitness! 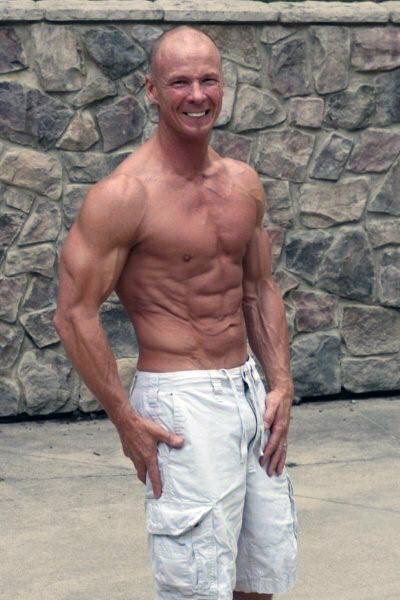 See what motivated him to get in the best shape of his life! When I was younger, I owned a gym and trained all the time. Back in the day, it was more about how much you could lift and how strong you were. Sold the gym in 1988, had kids and life got in my way, so I pretty much stopped training. As my kids got older, they got interested in sports, which lead to weight training, so I would train with them. About six months before my 50th birthday I decided that my goal was to be in the best shape of my life, complete with a 6-pack. I started training hard and became very serious about my nutrition (which is the key). I began taking supplements and haven't looked back! I liked how I looked, felt, and how people reacted to me and my new physique! My workouts seem to always be evolving and changing. I have tried many different splits, changing them from time to time, but what I like best is a push/pull routine. On Sunday and Wednesday I work my chest, shoulders, triceps, calves, obliques, and lower abs. On Tuesday and Friday I work my quads, hammies, back, traps, biceps, and upper abs. I tried working each body part just once per week and it just didn't seem to be enough. With my current workout, I hit each muscle hard for one workout and then just do one intense exercise for that body part the next workout. I weight train in the morning after a big breakfast, giving me plenty of fuel to power through my grueling two and a half hour workouts. When I was cutting for the contest I would do HIIT in the evening, three days per week at 6 p.m. on an empty stomach before my last solid meal. I could feel my body burning fat as energy to push through these very intense 45-minute workouts. All reps are done in a controlled fashion, three seconds on the negative portion of the rep and two seconds on the positive. Also, very important to make the mind-muscle connection, ensuring the isolation of the muscle you are working. I would consider my diet a VERY clean diet year round. I eat very few simple carbs or saturated fats. My diet is high protein and I pay close attention to my macro timing. To prepare for the bodybuilding contest I did my version of carb-cycling. It seemed to work pretty well to get my body to release the stubborn fat that it was trying to hold on to. Monday-Thursday and Saturday I was on the low-carb diet. Friday was a medium-carb day and Sunday was kind of my cheat day and I would increase my calorie intake by 600-800 grams. Even on my medium- and high-carb days I would still avoid simple carbs. I drink more than a gallon of water throughout the day to stay hydrated. I have fallen in love with Optimum Grape Essential AmiN.O. Energy. I have totally replaced drinking diet soft drinks with it: 2 scoops in a 20oz shaker cup. I usually drink it with all my meals. Hmm ... other than making you feel and look great? Really, does it get any better than that? I look at pictures of me 10 years ago, and I look older then than I do now. My new healthy lifestyle not only stopped the clock, but it turned it back a few years! The healthy footprint you leave on others is also unbelievable. My whole family eats healthy and trains to a certain degree. 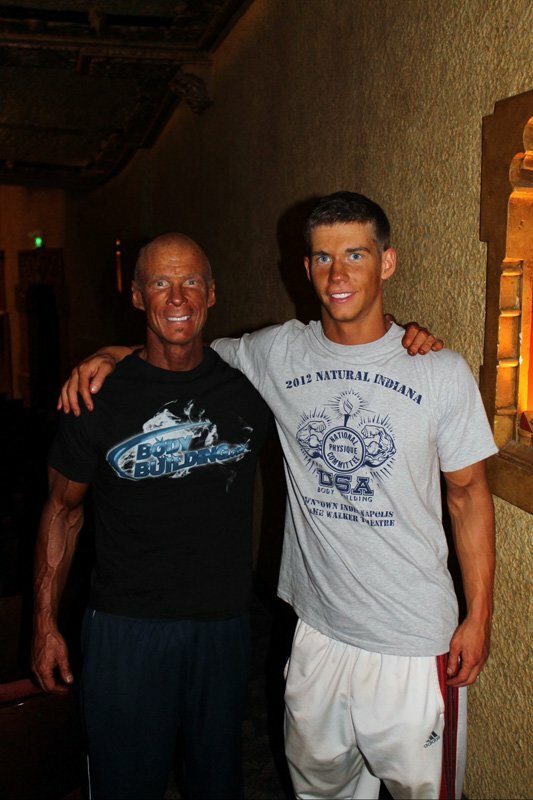 My son Austin has followed in my footsteps (hell, he has already passed me at the age of 19) in my love for bodybuilding. My younger son Garrett has just started getting highly motivated and he has already made great gains. I have to say that the one major factor in being motivated and staying on point, is having a great workout partner. My friend Travis and I have been working out together for more than three years and in those three years we both have only missed a handfull of workouts. Thanks, Travis! 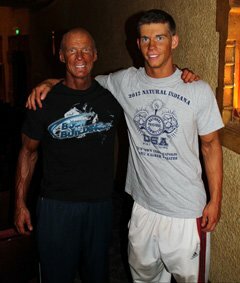 The two things that motivated me most were the BSN Bodybuilding.com Hyper Shred challenge and my son, Austin. I had entered the Hyper Shred Challenge and really tightened down my diet, along with adding cardio to my weight training, and I started seeing my body transforming into what I felt was a competitive physique. My son had already entered the 2012 NPC Natural Indiana show and challenged me to enter ... and I did! The amazing thing was I wasn't even slightly nervous and loved every second of being on stage. What a rush! I'm planning on competing in a contest in October. I feel if I can add a couple of inches on my legs I will be hard to be beat. Then I would like to look at competing in the grand masters division on a national level. It's never to late to start! 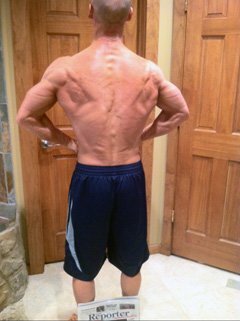 I entered my first contest at 52 and I am in the best shape of my life right now ... and looking to improve a little every day! Frank Zane had the perfect body as far as I am concerned! That's my goal! Where do I start? Bodybuilding.com got me started in the right direction and took me all the way to the bodybuilding stage. When I first found bodybuilding.com, I spent a lot of time in the store trying to figure out what kinds of supplements to take and what brands worked the best. What a great place to research and get new ideas on products to use. It helped me figure out what type of supplement I was looking for. Then I would go to the review section to see what people had actually used them and thought of them. Anytime I get a little bored with my workout or feel like I have slowed in making gain, I would head to the articles and look for new exercises and routines. The real life saver was preparing for my first contest. I needed a lot of information and fast. The supersite helped me with articles and videos for everything from contest information, to sodium intake, to tanning and posing. Every question I had was answered! And I saved the best for last. BodySpace helps keep me on track and motivated. It's great to connect with other members and share ideas.